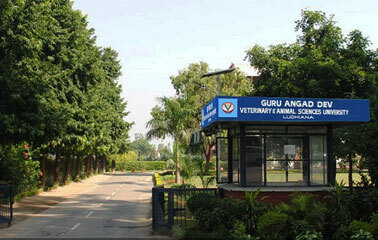 Admission process has been started for Diploma in Veterinary Science and Animal Health Technology by Guru Angad Dev Veterinary & Animal Sciences University (GADVASU), Ludhiana. GADVASU Registrar, Dr. S. Prabhakar informed that to meet the human resources requirement in the field of Para-veterinary area, university started Diploma in veterinary science and animal health technology. It is a 2-year course at Veterinary Polytechnic, Kaljharani (Bathinda) and Baba Hira Dass Ji, College of Pharamacy, Badal, a Private college, affiliated to GADVASU, Ludhiana. In both the colleges' seats no. is 80 each. Dr. HK Verma, Director Extension Education informed that students who have passed 10+2 with Biology, Physics, Chemistry and English can apply for admission to diploma course. Admission will be on the basis of merit of entrance examination scheduled on 26, August 2018 at GADVASU Ludhiana. Prospectus and application forms for admission to diploma course are available only online on the university website www.gadvasu.in. Last date for receipt of application forms is July 13, 2018 without late fee whereas with late fee the last date is July 20, 2018. The First counseling is scheduled to be held at the Silver Jubilee Block, College of Veterinary Science on 11 September 2018 and second will be on 05 October, 2018. Detailed information can be obtained from the university website www.gadvasu.in. Further the selected students will study at Vety. Polytechnic Kaljharani (Bathinda) where there is excellent Hostel and other related facilities said Dr. Verma.